On Friday morning Christine came in quite early to pick me up and take me on a car ride. I enjoy car rides after I overcome my initial nervousness, and thought we were going somewhere fun. I was wrong. I may have to re-think my opinion about Christine because she took me to another dog doctor named Dr. Rowe at Aid Animal Hospital. The reason for this adventure is because a while back, I started to limp a bit when playing fetch with volunteers and the humans who take care of us. Pete in all his wisdom became concerned and asked Dr. Johnston, the Shelter Veterinarian, to examine me, and she thought I should be evaluated by a specialist. I had a very thorough examine at VCA Welborn Animal Hospital, and had pictures taken of my bones (I believe these are called radiographs, or x-rays). The pictures showed I have arthritis in my left elbow, which is mild, and moderate arthritis in my right elbow. I also have something called “spondylosis of the lumbar vertebrae” which is complicated human speak for something that happens to our bones as we age. I have been on anti-inflamitory medication, both tasty tablets and injections. The reason Christine took me to Dr. Rowe is for something called acupuncture which means I had a lot of needles stuck in me with the hope they will make me feel better. The tiny sharp needles were placed in areas where I have muscle spasms (caused by arthritis and spondylosis) to help reduce the tightening of the muscles, and release good things called endorphins both through my spine and my brain. Although I had reservations about whether or not treating me like a doggy pin cushion would work (and the sensation is very weird and rather difficult to explain), during my treatment I did start to relax, and almost fell asleep. I was very good for Dr. Rowe, and must admit I did feel better afterwards. I even smiled for Christine and Jana (another human who does a LOT for all of us here, both dogs and cats) after my treatment. I almost fell asleep on the ride back, but I did not want to give away to Christine how relaxed I was. 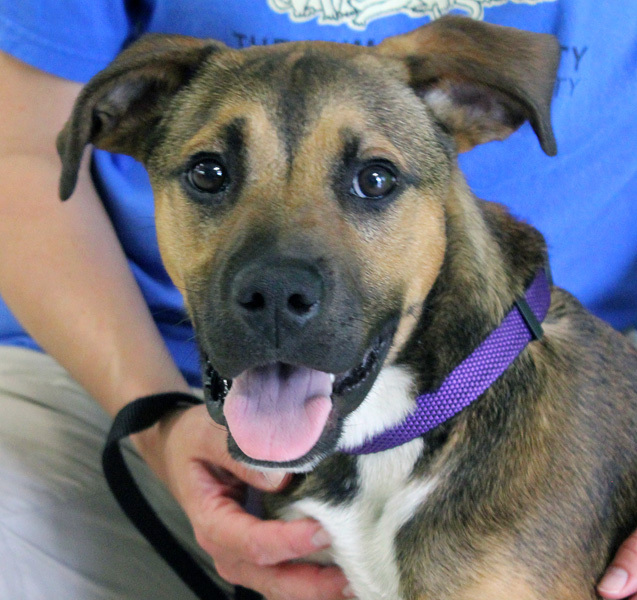 She did give me several delicious Milkbones when we arrived back at the shelter… so I guess I will forgive her. HSGKC is a very special place, and we are lucky to have so many who love us and are willing to do whatever they can to help us out. My acupuncture is being paid for by the kind individuals who donate to HSGKC’s Gabriel’s Fund. I will keep you posted about my progress with this acupuncture… I heard Jana and Christine schedule a few more appointments for me. I am very ready for a nap now, so I bid you good day. 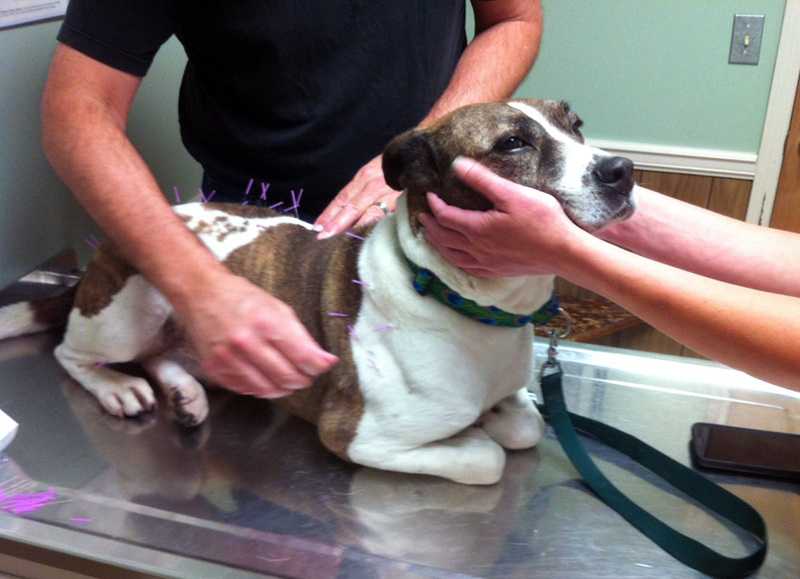 This is me during my first acupuncture treatment… notice how brave and well-behaved I am. And here I am after treatment. I have to admit I did feel better! Hi, my name is Bear. I’m a Black Lab mix, and I’m about 13 months old. I guess the reason I have the nickname of “Braveheart” is ’cause I’ve been through a LOT already, and I’ve been brave about it all… and I’ve got lots of love to give. I was picked up by Kansas City, KS Animal Control in April, and went right to Blue Pearl Specialty + Emergency Medicine for Pets ’cause I was really hurt. I had surgery there to fix my pelvis (it was broken), and then came here. I was real scared when I first came in… and on cage rest for almost 8 weeks. I was nervous with our humans here, and it took me a while to trust the humans who were taking care of me. I wasn’t mean or anything, I never tried to bite anyone, I was just real quiet and didn’t know how to act. I moved into the main kennel a couple weeks ago, and that’s been interesting and fun to watch all the other dogs. I’ve learned to like lots of humans like Pete, Alex, Lea Ann, Joyce, Christine, Nicole (they all work here and take care of me or spend time with me), but it does take me a while to show new people how affectionate I can be. If I really know you, then I show my silly side by smiling at you, and I love to be petted, and brushed. I went to a couple satellite adoption events, too, and was real well mannered with the new humans (big humans and little ones) and dogs I met. I had fun and got lots of treats and attention. I’ve met a few dogs here, and so far Pete, Christine and Alex think I’d do well in a home with with either a mellow dog or puppy. I’m still trying to figure out how to play with other dogs, but I think I’m doing okay… you know, all things considered. 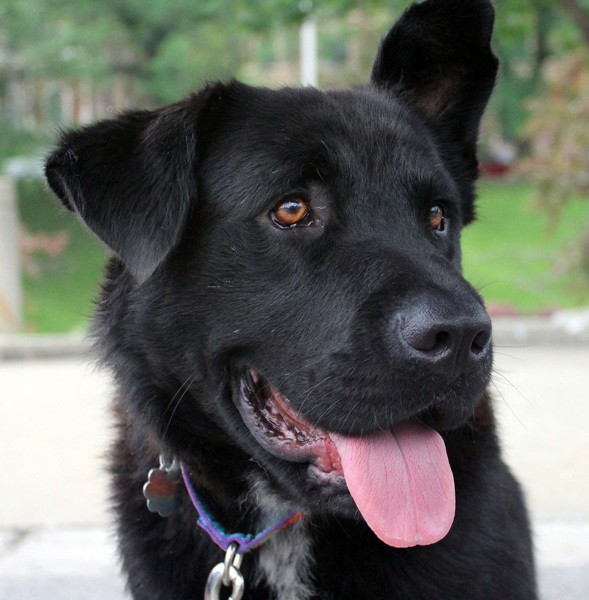 I really want a forever home… I’ve heard from the other dogs that black dogs (and cats) are sometimes harder to find home for ’cause humans can be “superstitious” (I’m not sure what that means totally, but I guess it’s harder for us to find homes). I love humans, even though it does take me a while to warm up to new humans. I do like to doggy toys, and short walks right now (the vets said that I’m ready to be adopted now but I’m still a bit nervous and moving a little slower than most 13 month old dogs). I’d be fine with young humans (maybe like 5 years or older), and another dog or two if they’re mellower. I’d probably be fine with cats, too… they are very strange creatures. My energy level will probably be medium, so I don’t need a really active family, but will want to go for walks and explore things. I’m a pretty easy going guy in a lot of ways, so even if you’ve never had a dog before I’d be good for a first time pet owner. I’m gonna go for now… I like watching the antics of the dogs now that I’m out in the main kennel. Leo, Copper, Gandalf, Nemo and Elvis are all lots of fun to watch! Elvis really makes our humans work to bring him in at the end of the day, which I wouldn’t do, but it is funny! PS If you want to help save other dogs and cats who come to HSGKC with serious injuries like me, or who are sick, please make a donation to Gabriel’s Fund. Thanks! This is me after I had my surgery. I needed help walking for awhile. And this is me at Dog-N-Jog on June 8, walking on my own and doing just fine! Hey humans! What’s up? I’ve got lots to tell ya ‘bout my new life, so here it goes: Back in April this cool woman came in wantin’ to adopt a “harder to place” dog, like Shine, or Smiley, an’ after Christine talked to her for a while, Christine thought I’d be a great match for the woman, (her name is Jen an’ she’s my new mom). Jen liked me a LOT the first time she met me, an’ she kept comin’ back in to visit, which was really cool. Christine had Alex (she’s one of my very favorite humans ever) an’ Stan (he took me to lots of obedience classes at The Dogs’ Spot) talk to Jen ‘bout me, too, cuz they spent time with me doin’ different stuff). Pete also talked to my new mom, too (cuz he’s awesome, an’ has known me since I came into the shelter, an’ he’s sooooo smart about us dogs). They told her all kinds of good stuff ‘bout me, like the obedience stuff I know, an’ how nice I walk on a leash, an’ why I got the nickname of “The Sheriff”. Anyways, after a while Jen thought she might wanna take me home, but wasn’t 100% sure yet (no one knew how I’d be in a house), an’ she was able to take me home to “foster” me for a while so she could like really get to know me, away from the shelter, an’ in her home. She ended up adopting me 3 weeks after she took me home. I’ve had lots an’ lots to learn ‘bout bein’ in a home… like a dishwasher (I’ve made peace with this weird machine thingy), can opener, microwave, toaster (humans got lots of stuff to fix their food… they’re kinda complicated), an’ house-training. I’m soooo awesome, cuz I learned real quick how to potty outside! My mom’s so proud of me cuz I’ve NEVER had a potty accident in my new home… I dunno why humans make such a big deal ‘bout that, cuz they potty inside, but if it makes my mom happy, whateve’. I’m still workin’ on not bein’ as scared of some stuff outside that move fast or make loud noises (bicycles, skateboards, garbage trucks, buses). See, the reason some of this stuff makes me nervous is cuz I lived on a chain, outside all the time before I came to HSGKC, so I wasn’t “socialized”, an’ dogs who live on chains have “issues”. We often aren’t well socialized with other dogs, cats, and people. We have “fear” or are nervous with things like skateboards, bicycles, and often kids and people because we can be teased and can’t escape the things that scare us because we can’t go any further than the length of the chain. Anyways, now I’m lovin’ bein’ in a home with a human all my own! I’m her “Sheriff” now…so I listen for stuff like cats, loud cars, an’ just keep an’ eye out for any signs of stuff that might not be good for me an’ my mom. I love bein’ with her so much I follow her all over the house, cuddle with her lots (she calls me a “huggy bear”, an’ I’m dog enuff I like her nickname for me), an’ protect the house from the cats who don’t know a dog’s livin’ there (I bark at them lots just to let ‘em know there’s a dog here so don’t come ‘round… hee hee), an’ when my mom’s sleepin’, I sleep outside her room or by the front door to make sure she stays safe. She’s taken me to obedience classes, an’ she’s really tryin’ her very best to help me with the stuff that scares me. I’m so, so happy she took a chance on me… I’m not the easiest dog cuz young humans make me nervous, I’m not real playful with other dogs, an’ I’m still workin’ on my fear of loud fast moving things outside an’ the other stuff I’m not sure of. The most awesome thing ‘bout my mom is she loves me for me, even tho I have some stuff I’m workin’ on gettin’ better at… she saw past all that stuff an’ decided to take a chance on me. Not to get all serious or anythin’, an’ I know dogs like me aren’t for everybody, but for the right human or humans, we’ve got lots to offer. Gotta run peeps… I’ve gotta watch some Rufus t.v. Me chillin’ in my new digs. 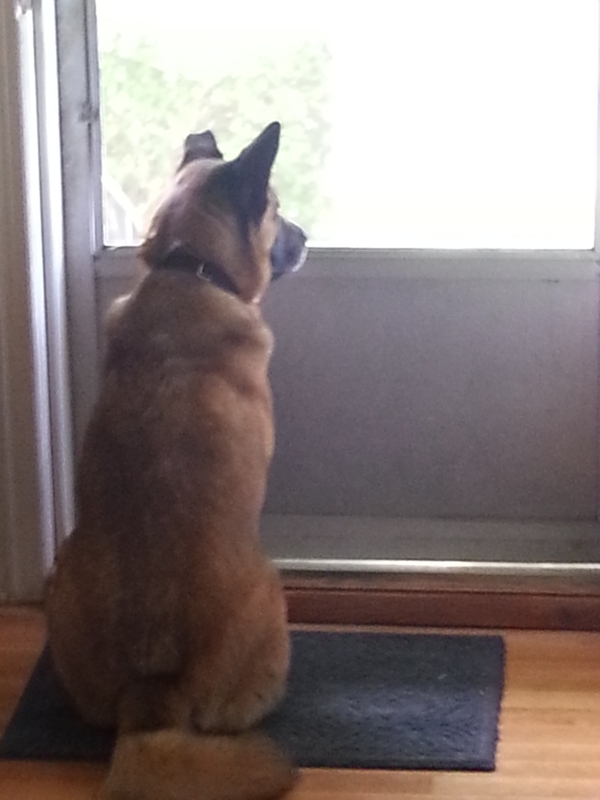 Me watchin’ out the front door… always on the lookout, ya know Rufus t.v.! 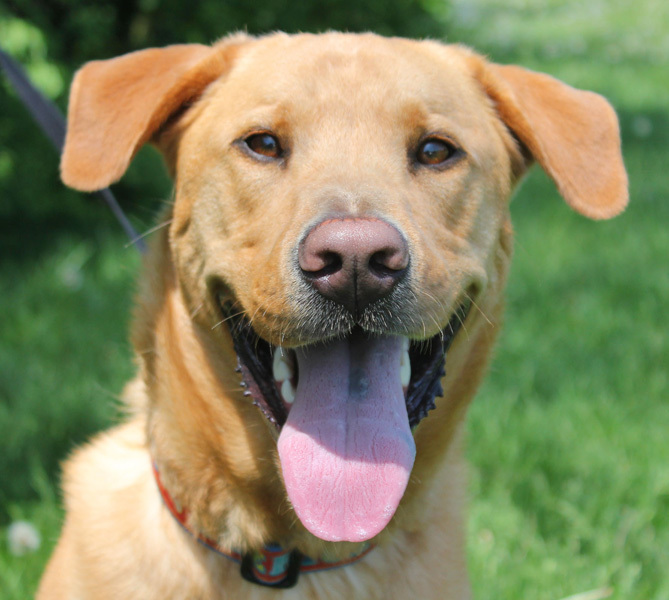 Hi humans, my name is Rio and I’m a 2 year old Lab mix. I was adopted a while ago and had to come back ’cause one of the humans I was livin’ with developed allergies to me… good thing HSGKC makes a lifetime commitment to always take back dogs and cats who can’t stay in their adopted home… sometimes things happen and stuff changes for humans and they can’t keep us. It stinks, but at least I got brought back here ’cause I already know most of the humans, and I know what bein’ in the main kennel is all about… it still took me some time to readjust, but I’m doin’ okay. 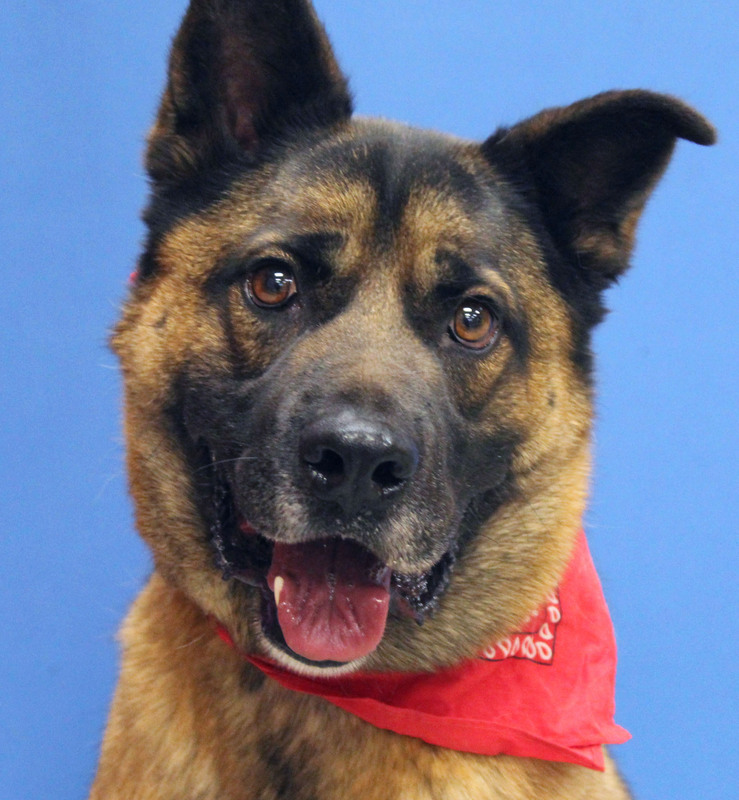 I’d like to have a roommate, but I’m kinda picky about my doggy friends, so Pete, aka “the Dude”, hasn’t found someone just right for me yet… maybe he will, and maybe I’m just gonna hold out until my new family comes along. For now I like goin’ on walks, and I LOVE pack walks, and playin’ fetch with humans like Alex, Pete and volunteers like Chuck (he took me for a walk the other day and played fetch with me! ), and just chillin’ with humans. When us dogs spend “quiet time” with humans, it usually means we get lots of treats, which is awesome! So I wanna go ahead and tell ya ’bout my ideal forever home. 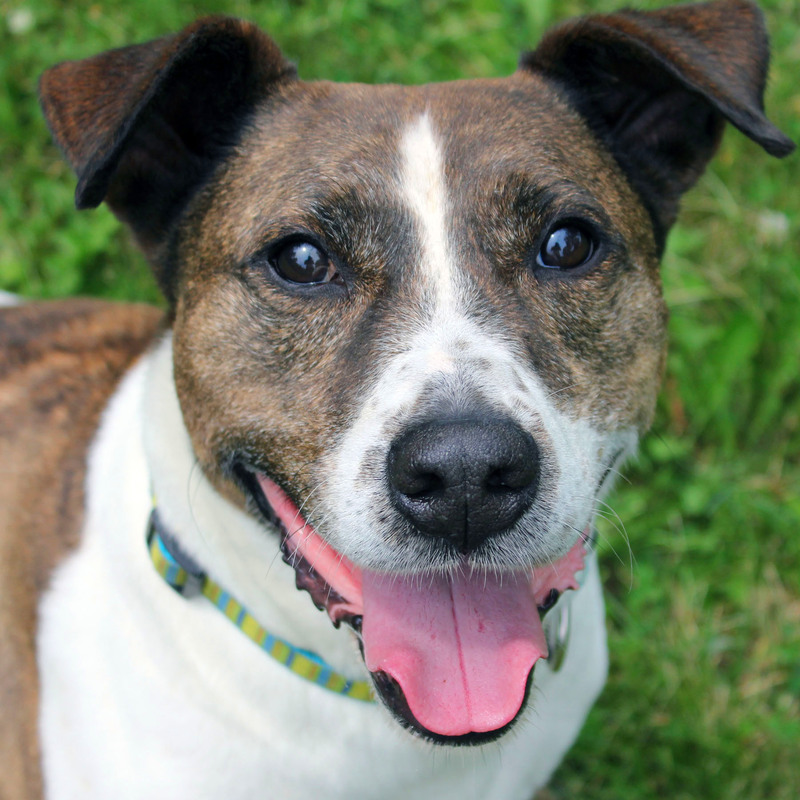 First, I’d love an active home/family, ’cause I do love walks and playin’ fetch. So humans who like to do stuff outside, like hiking, would be awesome (I’m a big guy but I walk nicely on a leash). I’d like a fenced-in yard, too, so my new humans could spend time playin’ fetch with me, ’cause that’s lots of fun, too. I adore the humans I know, but sometimes new humans make me a tad nervous, so my future family should probably have some experience with dogs, or lots of patience and willingness to learn about how to help me when I get nervous, so like takin’ me to obedience classes would be good ’cause I’d meet new humans in class and dogs. ‘Cause I do get nervous sometimes, I think maybe a home without real lil humans would be best. I’ve been good with other dogs in the past, but I’m bein’ very picky right now, so if ya wanna meet me and ya have a dog, we gotta meet at some point… but that’s our human, Christine’s job to figure all that kinda stuff out. 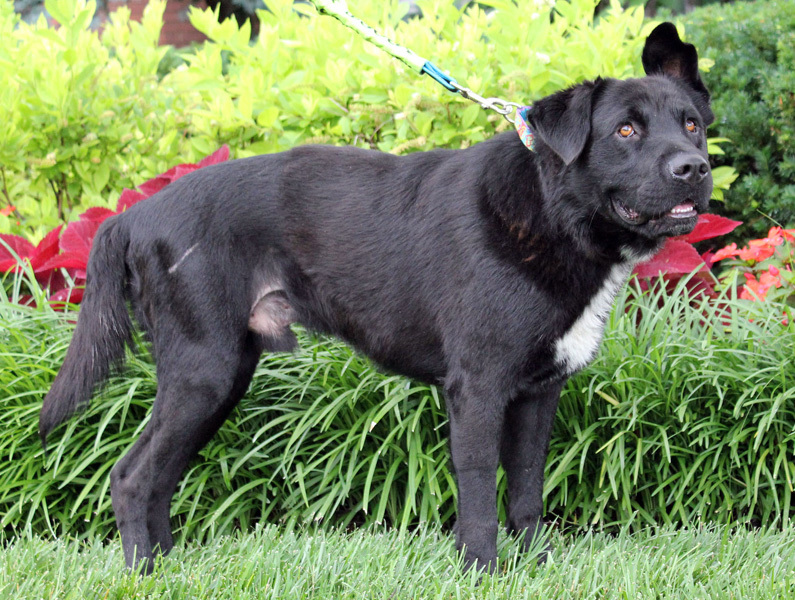 But I will tell ya that I’m a lotta fun, and I’ve been told I’m quite the handsome guy, and I’m gonna be a very good companion for someone who also likes to keep active and is a good match for me! That’s all for now! Bye! Hello, my name is Rosie. 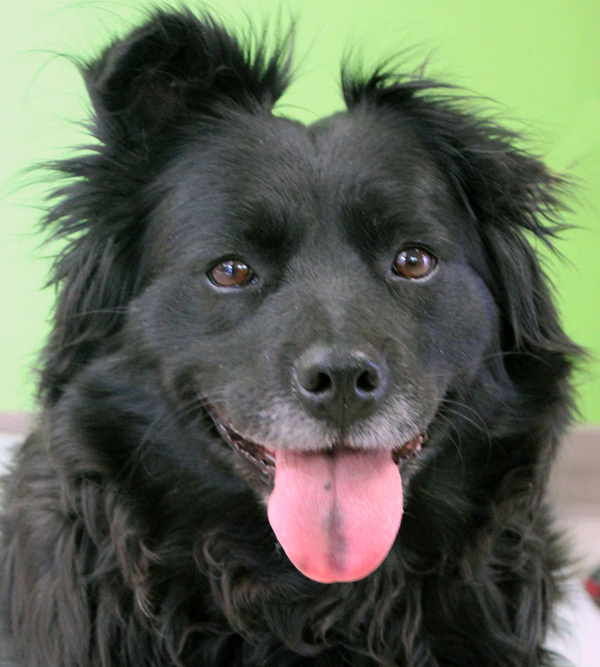 I’m a 4 year old Spaniel/Retreiver mix with really silky fur. All of our humans here love me and think I’m an awesome dog, because I’m laid back, gentle, easy to walk, quiet, and I keep a clean run (even though my roommate Baloo isn’t house-trained, yet, I’m working with him on it). I do like most dogs, but I’m not really playful, but probably would be with a medium energy pup or young adult dog. I love hanging out with humans, and I like to sit next to them, even if I have to jump on a bench to be by them. I’m a tad overweight, but healthy. I can’t help it, I’m what humans call “full-figured” (they have such funny terms for things… that’s why I like them so much). So… I should probably tell you 2 things about myself that are pretty important. I was adopted from here in 2010 and had to come back here (March 13, 2014) because I wasn’t doing really well with my former family’s small humans (kids). It’s not that I don’t like them, I just don’t know how to act around them and because they’re so busy running around, playing, and getting into things, like my food, I’m uncomfortable with them. Also, my food is MY food, meaning I do not share well with other dogs. I’m not “food aggressive” with adult humans or really aggressive with dogs, I just don’t want to share. I would really love to have a home again… HSGKC isn’t a bad place at all for dogs and cats to be, I just want to be in a home again with my very own family to love me. 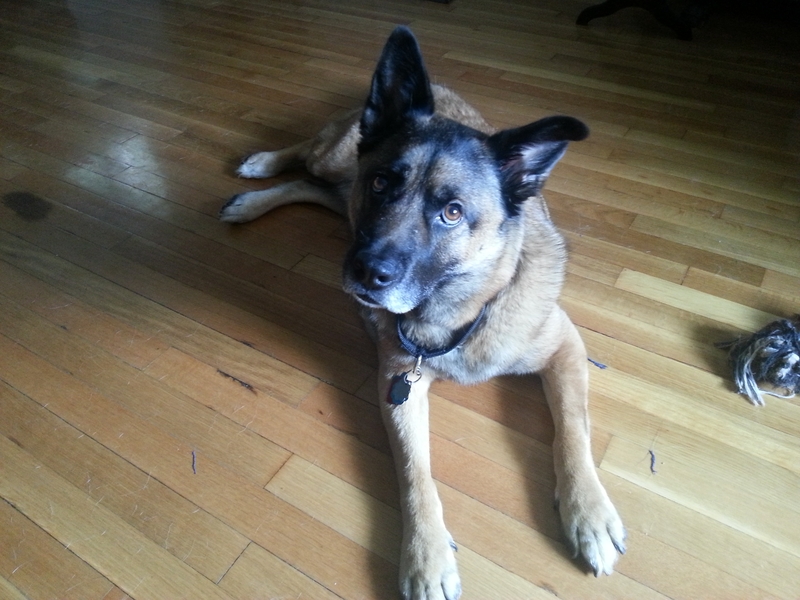 I would be a good dog in an apartment, duplex, or condo because I am quiet and calm. 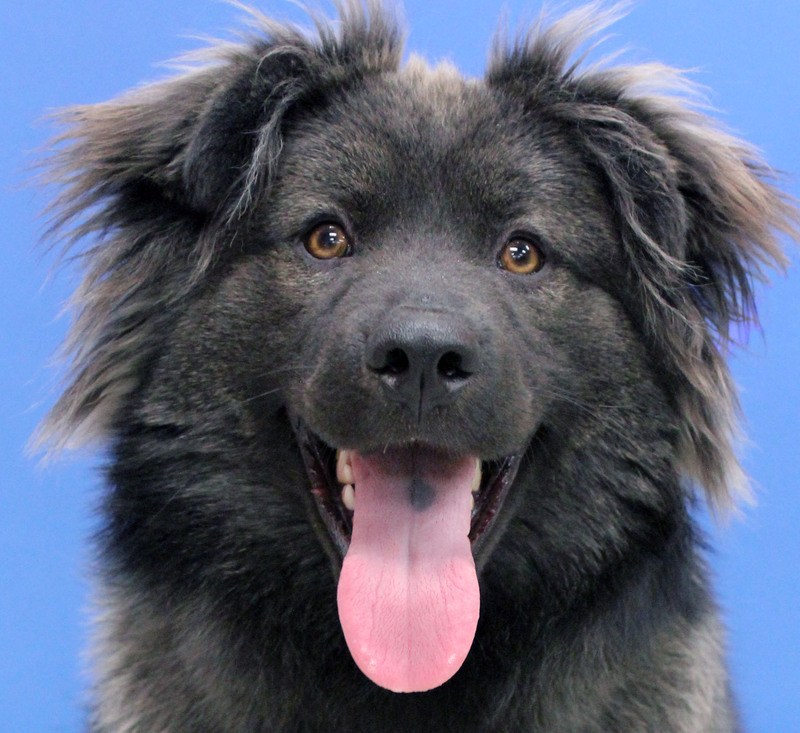 I’d love humans to take me on walks (as long as the weather isn’t too hot, I do have a solid black coat so I don’t like walking as much when it’s really hot and humid outside), and have a nice bed to curl up on… or next to humans on a couch. Well, I’m going to go for now and enjoy some time out in the yard with my roommate. This is me getting ready to go on a pack walk with a volunteer. 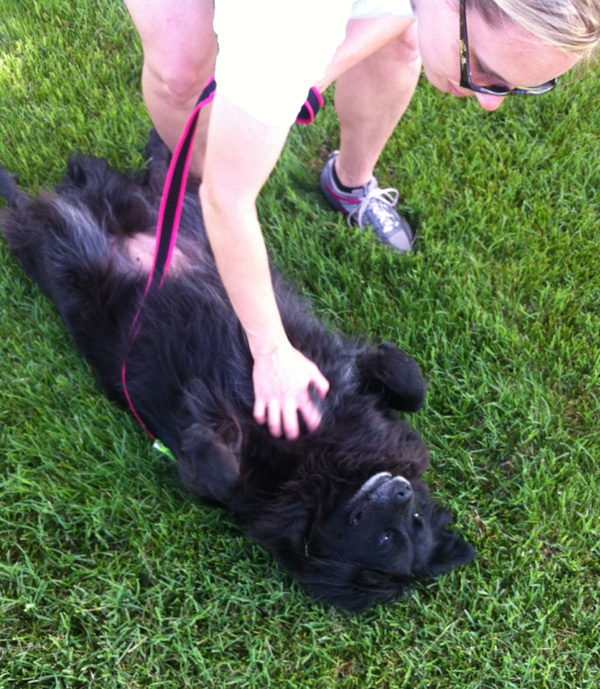 And here I am at a satellite adoption event getting a belly rub! hi everybody my name is Hooper! i don’t totally understand this blog thingy, but my roommate, Copper, told me it’s my turn to blog today an’ tell ya some stuff ’bout me. i came here ’cause i was real sick with somethin’ called parvovirus… it was real yucky an’ no fun… so i went to a special kinda place (VCA Welborn Animal Hospital) where the humans there gave me a bunch of stuff to make me better, then i came back here to recover in the quarantine room. when i was all better, i moved out to the main kennel where most of the doggies an’ puppies live. i got a roommate fast, that’s Copper, an’ he’s lots of fun to hang out an’ play with. he does this real neat trick that i think is frustrating for our humans, but i think it’s awesome– he jumps fences. i like hangin’ out an’ runnin’ ’round with him. Copper really likes to play fetch when humans hang out with us while we’re playin’, an’ i wanna play, too, so sometimes i try to take the toys away from Copper so they’ll play with me, too… but sometimes i don’t wanna share, so our humans are tryin’ to teach me to share better. i dunno what the big deal is, but i guess it’s somethin’ i’ve gotta learn. i just heard from Copper and Grizzly that i get to go to Nebraska Furniture Mart tomorrow AND to Dog-N-Jog on sunday! i’m so excited i get to go with Copper an’ Grizzly, an’ Angie, an’ Bear (he’s been here for a bit getting better from bein’ maybe hit by a car) an’ Joy, a doggie who’s in somethin’ called a foster home… i dunno what that is but i think i’ve heard it’s a nice thing humans do for us while we’re waiting for our forever homes. gosh, i got side-tracked… anyway i had so much fun the last time i went to a satellite… and this weekend i get to go to 2! satellites are awesome ’cause we get to meet lots of new humans an’ we get lots an’ lots of attention, an’ treats! if you have some time you should check our website for more info ’bout us, an’ the satellites. i’m gonna go for now… i’m so excited i gotta go tell the other dogs ’bout it. bye! hi humans! i’m sooooo excited ’cause i found out i get to go to 2 satellite adoption events this weekend… probably ’cause i’m awesome with humans an’ pretty much every dog or puppy i’ve ever met! on saturday, i’m going to Nebraska Furniture Mart an’ i’ll be there with some other doggies from 11-2 AND i get to go to Dog-N-Jog on sunday! i’ve heard Dog-N-Jog is lots of fun… an’ it’s a cool event ’cause it raises money for our shelter so our humans can help dogs like me who gotta have surgeries to make us better. 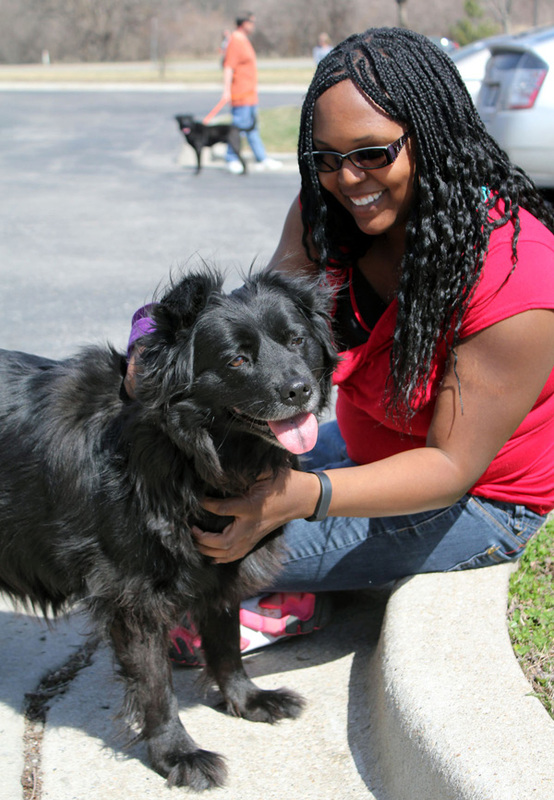 i get to meet lots an’ lots of new humans… which means… TREATS! yay for treats! anyways i’m really hoping an awesome family will meet me an’ wanna make me a member of their family! i think maybe all my fur scares some humans off ’cause they think it’s lots of work to keep up with… but i’ve been told it’s not. i just have lots of fur, kinda like long-haired cats (i dunno what that’s all about, but whatever). anyways, i guess that means i don’t shed too much, but need to be groomed… so i have to have a bath, an’ then maybe a hair cut or somethin’ like that! i wanna look my very best this weekend! last week i finally gotta run ’round the yard without a leash on after recovering from my hip surgery. i was so excited i ran circles ’round the yard, an’ then jumped an’ splashed ’round in the cool “kiddy” pool our humans bring out for us when the weather warms up… it’s lots an’ lots of fun! i gotta wait a lil’ longer ’til i can have a roommate so i don’t “over-do it”… sheesh these humans an’ their rules… it’s ok ’cause i know they want me all better an’ don’t want me to have to have another surgery… but i can’t wait for a buddy to hang out with an’ run with an’ play with an’ snuggle with at night! 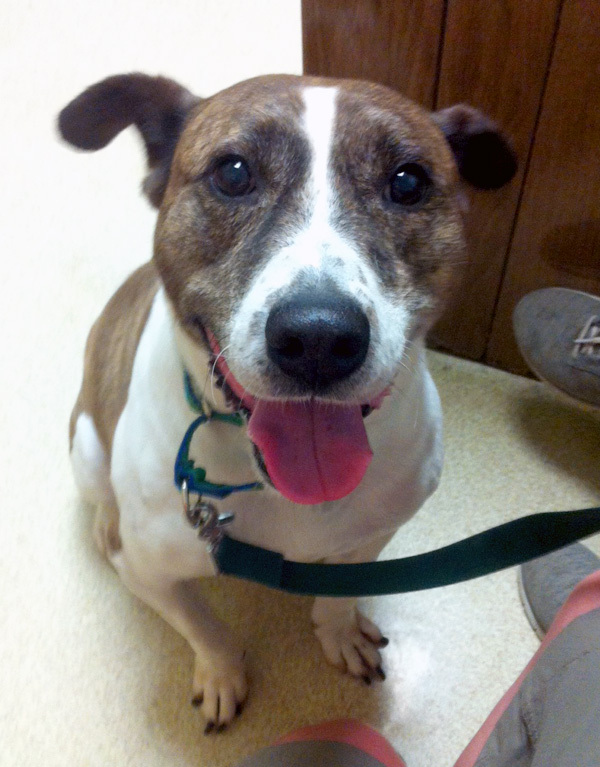 i know pete, aka “the dude”, will find somebody great for me… he’s one of my favorite humans! i’m gonna go for now but check out our website for details about Nebraska Furniture Mart an’ Dog-N-Jog!